Months ago, I wrote my comprehensive tips for backpacking West Africa which proved to be a big hit. For cycling Central Asia, I’m doing the same. The following advice is based on my personal experience – a ~5 month, ~7,500 kilometer bicycle journey from Istanbul, Turkey to Bishkek, Kyrgyzstan – through Georgia, Armenia, Azerbaijan, Kazakhstan, Uzbekistan, and Tajikistan. My tips are based on these countries, yet I try to include commentary about alternative routes as well. In all countries I crossed except for Turkey, Russian was the lingua franca. All of these countries used to be a part of the Soviet Union, and Russian is spoken by both the older and younger generations. If you have time to spare before your tour, take Russian classes. You’ll have a far easier time ordering food, finding camping space, getting your bike fixed, and making friends. As we know, the best part about traveling is the people we meet, and speaking Russian opens this door wide open. My Russian is survival-level at best: I can say things like where, tent, food, hungry, how much, kilometers, bicycle, water, yes, no, please, thank you, and maybe count to 10. I wish I learned more beforehand. More or less, there isn’t a single bike shop between Istanbul and Bishkek that stocks top-quality parts (think Schwalbe Marathon tires, titanium screws, etc). Bring your own. I found a few decent shops along the Turkish Black Sea Coast as well as one in Baku, but it’s best not to count on them. For more basic things like gear lines, inner tubes and break shoes, you can buy them on the road. Bikes are worldwide and basic supplies are available. You might have to spend 4 hours in a steaming bazaar trying to find the one guy that sells bike parts, though. Additionally, I note that if you’re riding with vertical road breaks as opposed to v-breaks, you will not find much in the way of spares. Road bikes have not caught on in Central Asia. A part of my break lever snapped while in Georgia, and I shipped new ones from my shop in Istanbul to Tbilisi in solution. I took them to the supposed best bike shop in town for help, and they had no idea how to do it. I instead grabbed the allen key in frustration and figured it out myself. In the Georgian, Armenian, Tajik and Kyrgyz mountains, I was cold. Bring a strong sweatshirt, a a waterproof wind-resistant coat, warm socks, some type of pants, a neoprene gator (many uses), and my personal favorite – long underwear! The latter is super effective and doesn’t weigh much. Additionally, I’d recommend you to bring short-finger cycle gloves, long-finger cycle gloves, and a thinner pair of ski gloves. It can get very cold when descending from some of those mountain passes. Lastly, if you find yourself ill-prepared while on your tour, you can always buy items from local bazaars and certainly in big cities. There are many sections of these countries with few places at which to buy food and water. Over the 500km from Aktau to Beyneu in Kazakhstan, there are roughly ~8 places to buy supplies. 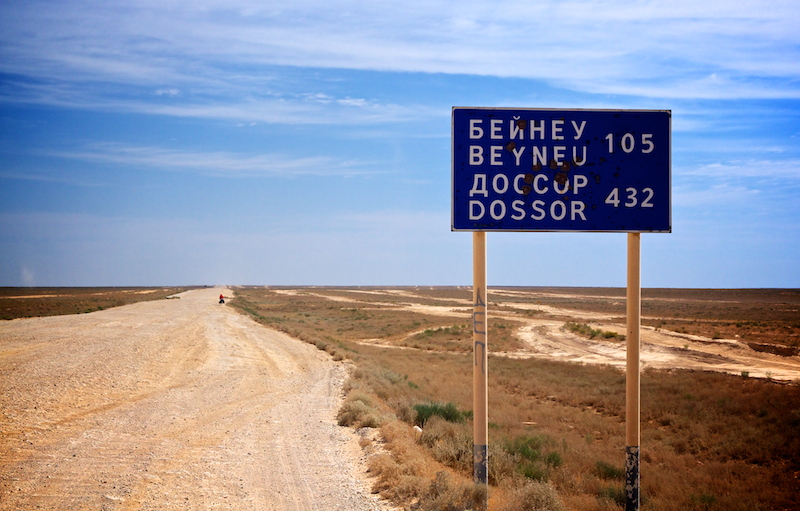 Over the 500km from Beyneu to Nukus, Uzbekistan, there are 3 places. 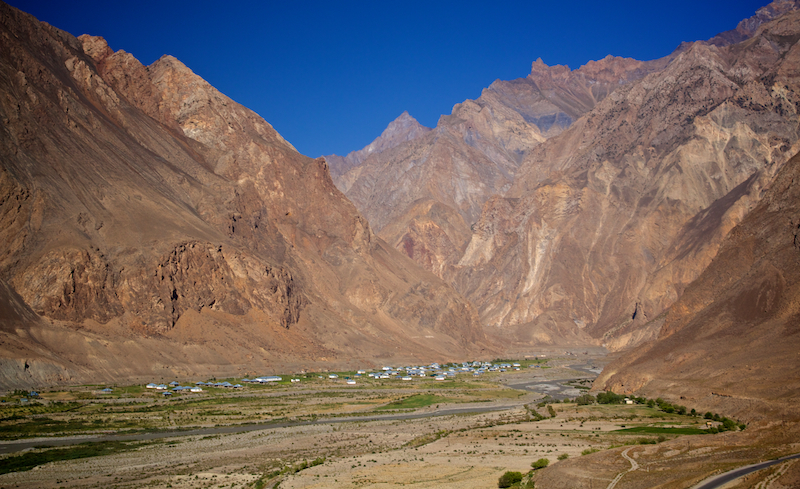 On the Pamir Highway in Tajikistan, places are limited as well. Before tackling these regions, study blogs. There is plenty of information from those before you about where the food and water is located. This will help you to stay sane, ration your meals and best pack your bike. On my tour, Tim Goes For a Bike Ride was a blog I referenced frequently for such advice. Turkey is packed with mosques. Mosques are a great place at which to sleep. Simply ask to crash in their mud room, in the mosque itself, or set your tent up on their property. You’ll usually be obliged. In Central Asia, outside of major cities, accommodation is scarce. However, tea houses are not. A Central Asian tea house – also known as a chaihana – is a roadside establishment serving tea in small bowls. Several lamb-based dishes are served as well. Food is typically consumed atop a square platform elevated two-feet off the ground, with a thin mattress covering each side of this square and a plastic mat in the middle. Locals will consume food while lying on these mattresses. As such, a chaihana will have many. At the end of the day, simply roll up, park your bike, order a tea, and after 15 minutes of pleasantries, ask to sleep on a mattress for the night. You’ll usually be obliged. Sometimes, you’ll be asked for a trivial fee – one or two dollars at most. Personally, I slept in roughly 10 chaihanas. I recommend them highly. When leaving Tbilisi, you can chose either the north road through Azerbaijan to Baku, or the south road. The north road is hilly and indirect. The south road is straight and dead flat. I took the south road, and it was the most interminably boring 5 days of my cycle tour. It was hot, busy, and ugly. I do not recommend it. Instead, take the north road. It is purported to be gorgeous and green. Apparently it takes you through more interesting towns as well. If I cycle from Tbilisi to Baku again (unlikely), I’ll be taking the north road through Azerbaijan. Baku is immensely expensive. In fact, the Azeri manat is stronger than the US dollar and on par with the euro. In addition, there is but one true hostel in town which commands a nightly fee of ~$17. Instead, use CouchSurfing or WarmShowers. Hosts are limited though – especially in summertime when cyclists come through – so plan in advance. If both fail, there is a bicycle club in the smack-middle of the Old City which, when I was there in July 2013, was allowing cyclists to sleep for free on the padded floor of their upstairs office. During my week-long stay in this office, at least 5 other cyclists stayed concurrently. Unfortunately, I don’t remember the name nor specific directions as to how to find it; kindly ask around yourself. This is a really strong option well-worth exploring. Turkish gas stations are clean and in abundance. They have chocolate, bathrooms, and often free wifi. In addition, they are staffed by Turks, who will offer you tea and genuine interest the moment you arrive. Lastly, gas station owners will generally be thrilled to have you rest on the plush couch in their plush office, or let you camp on their well-manicured lawn. Turkish gas stations really are your best friend. You won’t find much Gatorade in Central Asia. You’ll inevitably cycle in 40C heat. If you can, bring oral rehydration salts. If you can’t, make them yourself. To do so, simply mix 6 teaspoons of sugar and one half-teaspoon of salt for every liter of water. Of course, these ingredients are available everywhere. ORS does wonders for the body. 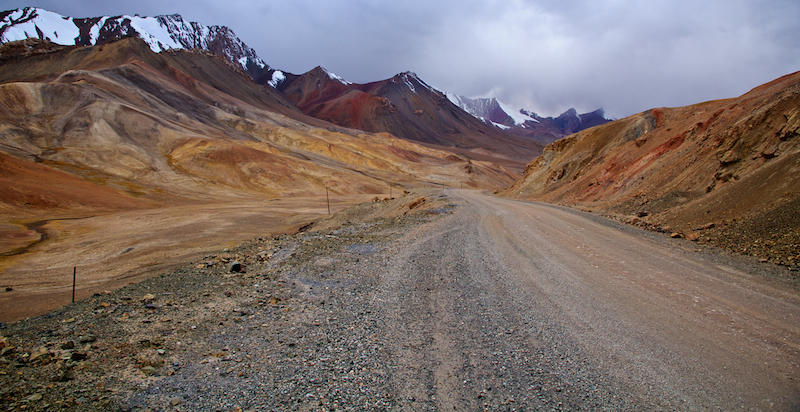 If cycling the Pamir Highway, you’ll need to obtain a GBAO permit in advance. The Highway lies in a semi-autonomous region of Tajikistan, and this permit allows you to enter. Many companies, Stantours for example, will pre-arrange the GBAO permit for you for a fee of ~$80. In reality, the permit costs $4. Unless you are really pressed for time, do not pre-arrange. Instead, obtain the permit yourself in downtown Dushanbe. Simply go to the bank – Amonat Bank, located at 30 Bukhoro Street, N38.57126, E068.7972 – pay the fee of $4, walk down the street to the OVIR (immigration) office, present your receipt, and receive the permit either that afternoon or the following morning. I can’t remember if you have to leave your passport. Regardless, the process is painless and straightforward. Cycling Central Asia was one of the most incredible things I’ll ever do. Many people ask me to advise them on similar tours and these are the top ten tips I give. If you have more questions, please leave them in comments or send me an email. I’d be happy to help in any way I can. What precautions did you take regarding wildlife (e.g. bears, wolves, cats, snakes and scorpions) will cycling and camping in Central Asia? I plan to cycle much the same route as you this year (2018); Istanbul to Bishkek via Iran and Turkmenistan. Where possible, I would like to wild camp.